Here is another fabulous treat that was showcased at the birthday party. I totally never would have thought of this! I had always thought that gourmet popcorn was something that you could only get from high end popcorn stands at the mall or hand delivered from small family owned companies in the midwest. This was pretty easy and turned out great! I am so glad we figured out how to make colored popcorn with kool aid. 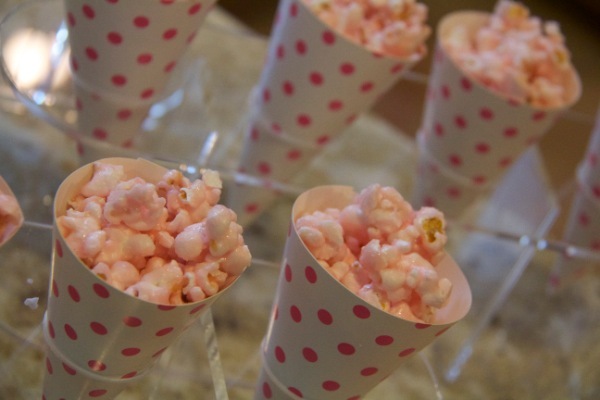 We popped the popcorn in our home air-popper and used a recipe found online to make it sweet, crunchy, and colorful. 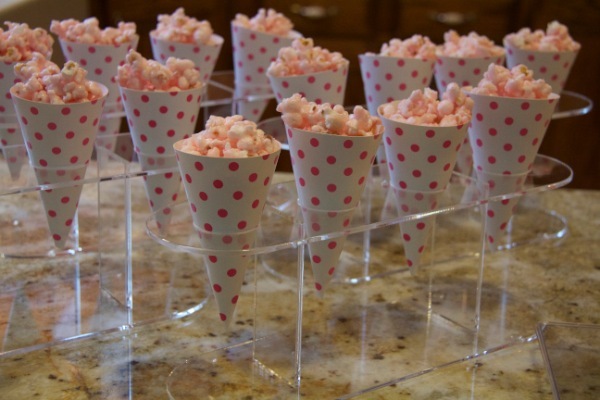 The acrylic stands are ones that you can use for ice cream cones and we used these cute little polka dotted treat cones to keep the popcorn easy to nibble on while chatting during the party. Boil sugar, syrup and butter/margarine together for 3 minutes. In a large shallow greased baking dish, spread out popped popcorn. Remove sugar syrup from the stove and carefully stir in the Kool-Aid and baking soda. This will make the mixture bubble — this is normal, but be careful not to get burned. Pour the sugar mixture over the popcorn. Carefully mix until well combined. Place it in the oven and stir every 10 minutes. Repeat this 3 more times. Take popcorn out of the oven and when it starts to cool, break it apart into pieces. It is good to let the popcorn cool overnight so that it can really dry and have a crunchy coating.